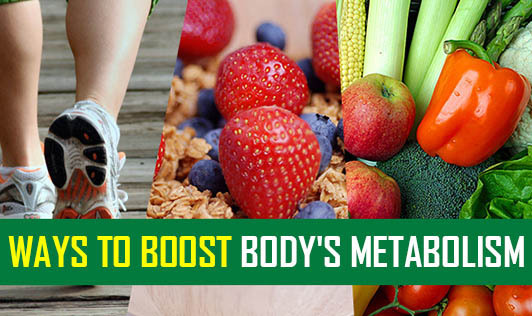 Metabolism is the rate at which your body burns calories in order to provide you with energy. Everyone's body burns calories 24 hours a day. Even when you sleep, you burn calories - but very few. If you're trying to lose weight, increasing the metabolic rate can enable you to lose more weight without cutting down on more calories. Make sure you eat breakfast - If you don't eat breakfast, you slow down your metabolism and the body thinks it's starving because you're going a long period of time without food. Adjust your diet - Resting metabolic rate typically increases two to three times more after eating proteins than carbohydrates and fats. Complex carbohydrates and high fiber foods, burn more calories than simple carbohydrates. So focus on increasing the intake of quality protein like egg and milk and milk products, complex carbohydrates like whole grains and high-fiber fruits and vegetables. Eat small, frequent meals - Giving long meal gaps makes your body get into "starvation mode," which decreases your metabolism as a means to conserve energy and prevent starvation. Skipping meals does not help you cut calories or lose weight; in fact, people generally eat less overall when they eat small, frequent meals and it helps increase the metabolism as well. Boost metabolism with aerobic exercise - Aerobic exercise that increases the heart rate can raise metabolism while exercising. Experts believe that aerobic exercise boosts resting metabolism for several hours, as muscles burn calories to recover and repair. Boost metabolism with weight training - Muscle burns more calories than fat does, so the more muscle you build, the higher the resting metabolic rate (RMR). Every muscle cell gained helps burn calories constantly, even while you sleep, and revs up when you exercise. This is the best way to increase RMR, which accounts for 60 to 70 percent of the calories burnt daily. Hydration - Dehydration can contribute to an inefficient metabolism, by affecting body temperature. Drink 6 to 8 glasses of water per day to keep your metabolism working effectively.